Quick one after the Iftar. 1. Did you remember your the first Ramadhan that you fasted when you were a little kid? I do remember the first Ramadhan that I fasted completely, the whole 30 days. I was in standard 3. All of us still in Sabah. Before that, I only remember the “Puasa sekerat Hari” term. 2. Did you remember getting rewards (read bribes) each day you fast? The smaller you age was, the bigger the reward would be? During my day, I only got 1 ringgit per day. Not bad actually. Hj. Lazim the one who came up with the offer that Mat Apih and me cannot refuse. Mok Ra too offered to us the same. That is why I fasted for the first time completely the whole month that Ramadhan. Another reward, I can choose whatever I want if my parents bring me in the pasar Ramadhan. Weird thing was, me and Mat Apih will choose cool drink only. Anything else never tempted us. At the end, we end up full with water before can even touch the other food. 4. Did you remember sleeping the whole evening because you have drained your energy, maybe because of not waking up for the sahur. 5. Did you remember playing at the back of the shof while the older praying the tarawikh at the front rows? During senior year in Faris Petra. If there was no warden around, it is our lucky day. The best thing was just after imam finished recite the doa, we ran like forest gump to the dinning hall. 6. And being scolded by the elders for making a lot noise? During junior year in Faris Petra. Not elders but the senior. 7. And only join the prayer when the imam was nearly going to ruku’? We always did that. Like Naziha said, our family always go to Masjid besar Kubang Kerian to pray the Tarawikh. The Imam will recite one juzuk per night. Total Rakaat is 20. So you imagine how long we must stand. The best way tho skip it is to join in during Ruku`. By the way Naziha taught us this trick. 8. And said aloud solawat to the Nabi Muhammad SAW competing against each other for which group is the loudest group? Faris Petra and Masjid Kadok Dalam. 10. Did you remember eating those delicious moreh? Moreh?. What the hell is that? hahahahh. After six years, can u blame me? owoss. logiklaa awk hok ajar sy abeje. masuk smyg dekat2 ngn ruku’. time tuh sy kecik lagi so ikot jah la abg2. tp i still remember la lepak2 dkt koridor masjid nge abepaih. terok perangai. i start fasting when I was in Penang..
why is half of my body is missing in the pic? 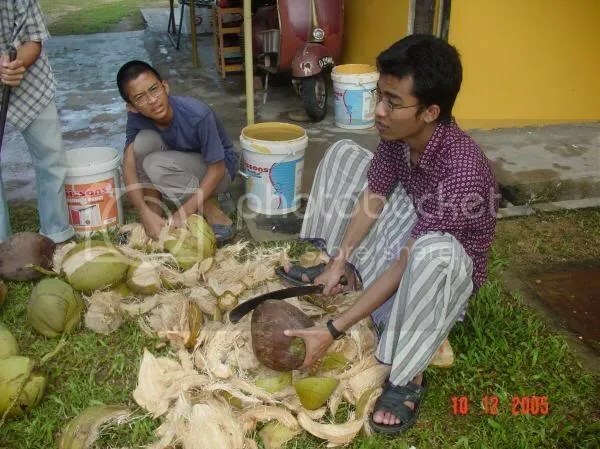 i was using one of the coolest gadget to tear the husk, instead of of the lame traditional parah style.. huhuhu.. but ajik is the coolest, tear it with his bare hands? why am i be blamed for all of these.. aduh..
butir nangka? i’ll try to plant the nangka later..
itulah ilmu(cara) yang ada bagi seorang bapa yang tidak berpendidikan untuk mengajar anak anaknya memulakan tanggungjawabnya terhadap Allah.amin……..
abah.. you’ll always be our hero laa. Itu pic ada nampak vespa la. denga kabar tempat kejadian didalam gambar akan di naik taraf menjadi bilik, 2 bilik kalau tak silap…hehe…teka apa sebab?